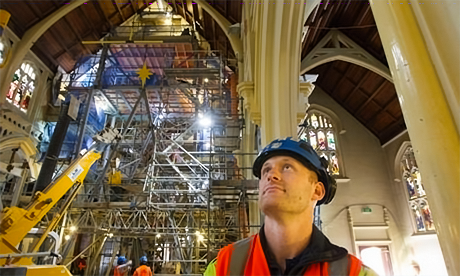 All going well, St Mary of the Angels church in Wellington’s inner-city will re-open by Easter 2017. Parish Priest, Fr Barry Scannell SM, confirmed the date on Thursday. Talking to Wellington’s Dominion Post, Fr Scannell is delighted with the Church’s progress and the effort of a lot of people. “We started the year with nothing and we ended up with around about $7 million,” he said. Currently a construction zone, the inside of the Church looks very un-church like, however once the strengthening is finished it will be hard to notice that anything has been done. With stained-glass windows a plenty, installing 50 ground anchors, fixing 10 columns, 9 portals and the roof is not easy, however contractors LT McGuinness got creative. Site foreman Matt Pattinson told the Dominion Post that a massive steel scaffold was created and placed on rail tracks so it could move along the floor of the church, providing a safe environment for workers while propping up the roof. With talk of reinstating Christ Church Cathedral ramping up of lately, those involved with the garden city church had been in the capital to learn more about the St Mary of the Angels strengthening, Pattinson said. Those wishing to donate to preserve St Mary of the Angels are invited to visit the St Mary of the Angels website for more details. St Mary of the Angels, staffed by the Marist Fathers is believed to be the world’s first neo-Gothic church built using reinforced concrete. In 2010 the Church was presented with an award at the NZ Concrete Society’s annual conference. Bestowed biennially by the NZCS, the award recognises excellence in the use of concrete in building and civil engineering structures more than 25 years old. In response to an invitation from the Marist Fathers of the province of Europe, the SMSM sisters are opening a small community in London, where they will work together with the Marist Fathers’ community of Notre Dame de France, Leicester Square, London. 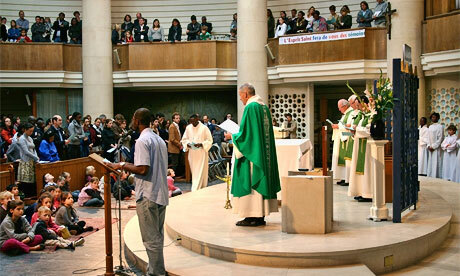 Notre Dame de France lies in the heart of London and is the Catholic francophone parish of London. As well as the pastoral responsibility for for those who speak French, the Marist mission also encompasses those who live in the central city and to London’s many visitors. The mission at Notre Dame de France also tries to make the most of its inner-city location as every year millions of people stream through London’s entertainment district in the West End, for example, the weekend of 9-10 June saw the annual “Spirit in the City Festival” taking place and Leicester Square Gardens provided the ideal setting for the largest Catholic evangelisation festival in the city. With a live stage program, music and drama, workshops, Eucharistic adoration and confessions, the festival brought together over sixty communities and movements to pray, celebrate and evangelise in a variety of ways in the churches and on the streets. The event created opportunities to engage in contemporary ways with people who otherwise wouldn’t have any contact with church.